Achen-Gardner Construction worked with the City of Tempe, Wilson Engineers, and Sunrise Engineering to install more than nine miles of 4”, 6”, 8”, and 12” water lines throughout two residential neighborhoods (bounded by Southern Avenue, Alameda Drive, College Avenue, and Dorsey Lane) and two high volume arterial streets (Southern Avenue and Rural Road). The scope of work was inclusive of all associated services, fire hydrants, valves, valve boxes, and other appurtenances in addition to the removal and replacement of associated sidewalk, curb, gutter, asphaltic concrete, and landscaping. In addition to the scope of work directly associated with the water line replacement, regional beautification efforts were made to provide added value back to the stakeholders which included crack seal, striping obliteration, slurry seal, microseal, raised pavement markers, and new thermoplastic striping within the entire limits of the project. Our team was diligent in using detailed planning, scheduling, and safety protocols which all contributed to the success of the project. The management of public relations was a key factor in achieving positive community responses on this project. 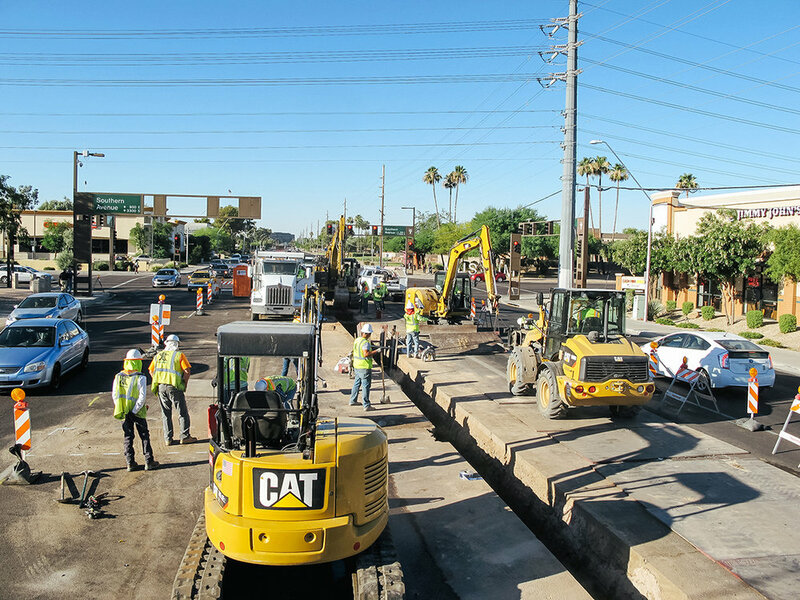 Achen-Gardner Construction used its own Project Engineer to work directly with a City of Tempe’s Public Information Officer in addressing stakeholder questions, comments, and concerns. Our team implemented a 24-hour hotline with immediate response capability, maintained a public information website and social media sites, held public meetings with stakeholders, and provided regular mailer updates regarding the project. We also assisted with one-on-one interactions and provided hand delivered notices to residents and businesses that were directly impacted by construction. Achen-Gardner Construction worked with the City of Tempe and design engineers to maintain functional operation of the existing potable water system while constructing and commissioning the new system. Total Quantities: 49,433 LF of pipe (4”, 6”, 8”, and 12”), 249 valves (4” to 12”), 841 services, 11,613 LF of ITS conduit, 85 fire hydrants, 24,724 SY of pavement, 7,327 SF of sidewalk, 1,394 LF of curb and gutter, 1,902 SF of valley gutter, 29 driveways and ramps, 171,011 SY of slurry seal, 84,011 SY of micro seal, and 15 miles of removal and replacement of lane markings and roadway striping.